It's official, a spring MSGM jacket is being added to my birthday wish list. The tough question is, which one should I ask for?! 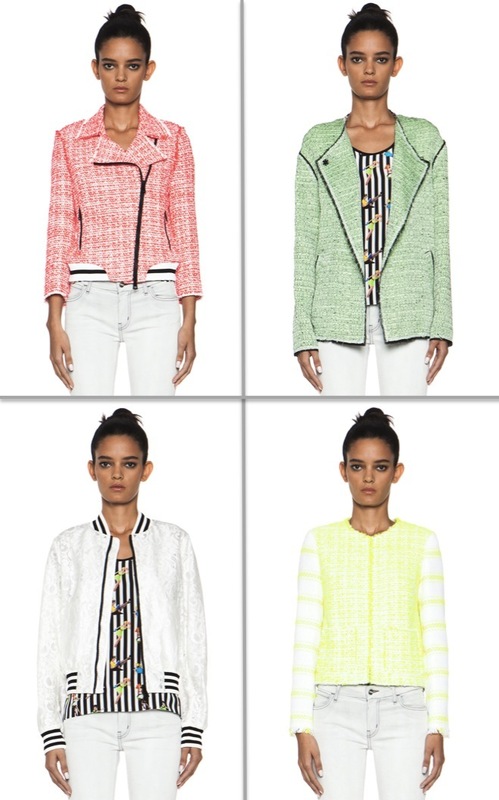 An attention grabbing tweed moto jacket, stripe boucle beauty, oversized neon number, or a ladylike lace bomber.. The Italian label has reworked traditional tweed jackets in bright hues with of the moment cuts, taking them from "ladies who lunch" to gals that brunch. Also in the mix is MSGM's stunning white lace bomber jacket - I love how the black and white striped trim adds a sporty appeal to the delicate fabric. While we're on the subject of MSGM, and since I hate to limit myself, I'm also crushing on their tweed floral print blouse, tropical print shirt dress and oversized stripe coat. Hm. I would go with the striped one! Oh I love the tweed moto jacket...just gorgeous! I would ask for that gorgeous red/pink first one! MSGM is so cool, I love that there is this young Italian brand around now. I love the mint green one, but they're all gorgeous! I loooove MSGM. I wish they weren't so pricey! Ugh! Love these especially the lime yellow one. I'd go for the striped one (light green). Seems like something you'll be able to wear for ages! difficult choice!! I vote for the yellow one!! I'll take that yellow jacket in a heartbeat! PS Feel free to stop by my blog, I am giving away fabulous Skin Owl Organic Face oils:) You will love them! Oh, so pretty! I love the lace bomber!! Ok.. so I pretty much need all of these now! Especially the striped jacket- so good!! I LOVE the oversized one..I just feel like the fit would go with so much and would give an easy chic look to any outfit. By the way, I totally agree - Forward is such a great site! Wow, I love that green one!